Zoggs Lap-Pro Designed With Swimmers In Mind | OhGizmo! “Designed by swimmers for swimmers” is one of the the taglines the company Zoggs has been using to describe their new Lap-Pro watch which is mainly targeted at those who swim competitively. The Lap-Pro features a ‘tap-pad’ watch face which allows a swimmer to record lap times simply by tapping anywhere on the screen. While most sport watches do include a stopwatch function they usually rely on rather small buttons for starting, stopping and marking lap times which is not a problem for someone just standing there specifically timing an event. But after swimming a lap as fast as you can underwater it’s probably a little difficult to hit the right button and this is why the ‘tap-pad’ interface was developed. After the race the watch can also provide the swimmer with a full summary of each lap including times, speed and an overall average. 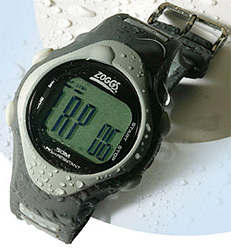 Oh, and it’s also water-resistant to a depth of 50 meters. The Zoggs Lap-Pro is currently available in both mens and womens sizes for just under $60. This watch actually doesn't look too chunky and horrible like a lot of performance watches. It looks really smart.